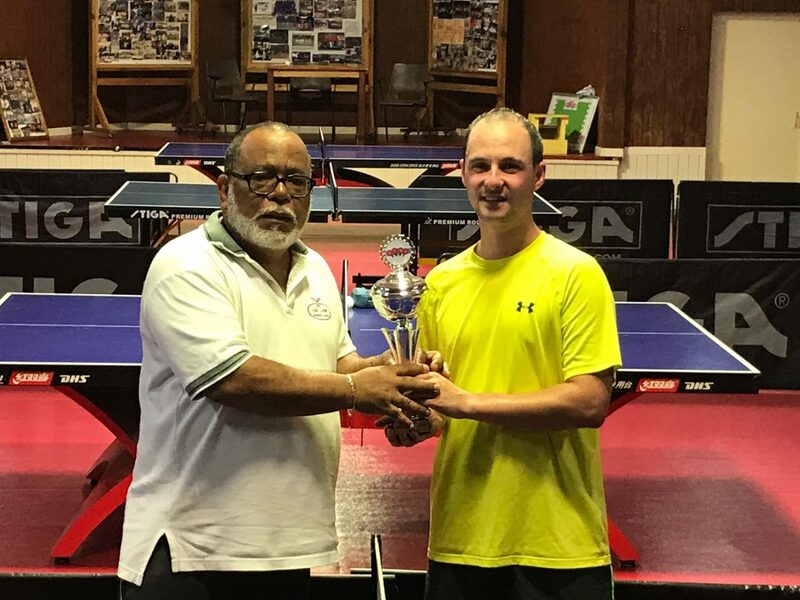 Last Tuesday March 16th the Curacao Table Tennis Federation has her second tournament named Hairburst. A tournament meant for the category Men Single Open. As the ranking was in play the interest was very high. There were 19 participants and the tournament was set up with 3 elimination games based on the knock-out system and to be continued after in a 4×4 group system. There were some very tight games like Raymond Begina versus Jacinto Zimmerman which Begina had to come back from a deficit of 2-0 to win finally 3-2. Sigmar Carmelia versus Henny Metry was another one which had to be played all 5 sets. The following 4 players passed to the semi final: Devon Meilink, Sigmar Carmelia, Dimitri Leon and Michael Dalnoot. Devon won easily his match against Sigmar 3-0, while Michael against Dimitri was the most electrified match where Michael had to fight his upmost to win finally 3-2. In the final Michael had to start completely exhausted from his prior match and could not withstand Devon who came decisively to win this Hairburst tournament and he won easily 4-1.